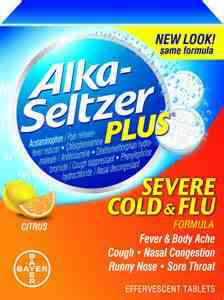 Yes it may sound crazy, Alka-Seltzer having a cold & flu medicine, I sure didn’t believe my friend the first time I was told about it but considering all the travelling I have done in the past 8 months and all the times I have started to get sick with my weak immune system I now firmly stand behind this product. It works best if you take it before you fly, even start a few days early to get your immune system kicked into gear with all that Vitamin C. The first time I was on the road my friend told me about this when I started to get sick and my cold was gone as quickly as it began after I had some. I prefer the effervescent tablets as they seem to work the best (dissolved in water) but the capsules are great too. This is something I never travel without!